Markdown is a simple markup language. It’s lightweight and easy to learn. 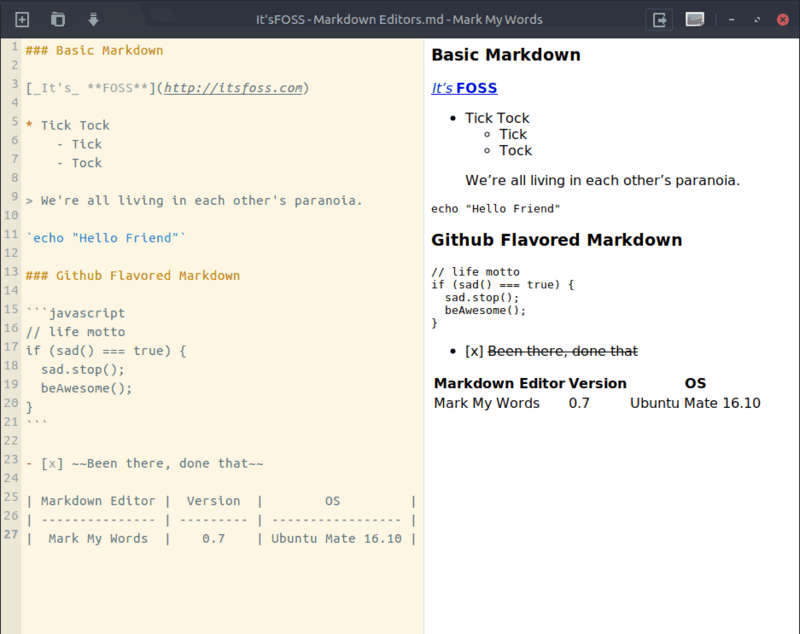 If you haven’t seen any markdown document yet, just head over to GitHub and enter any open-source project. The readme file almost certainly will be written using Markdown. Basically, you use some ‘code’ before your text and your text will be formatted for display accordingly. For example, if you use asterisks (*) before and after the text, it will be displayed in bold text. Not just GitHub, even several social media websites support Markdown, including Facebook. It’s often useful in writing documents, especially for developers. You can refer to this Markdown cheat sheet for quick reference. 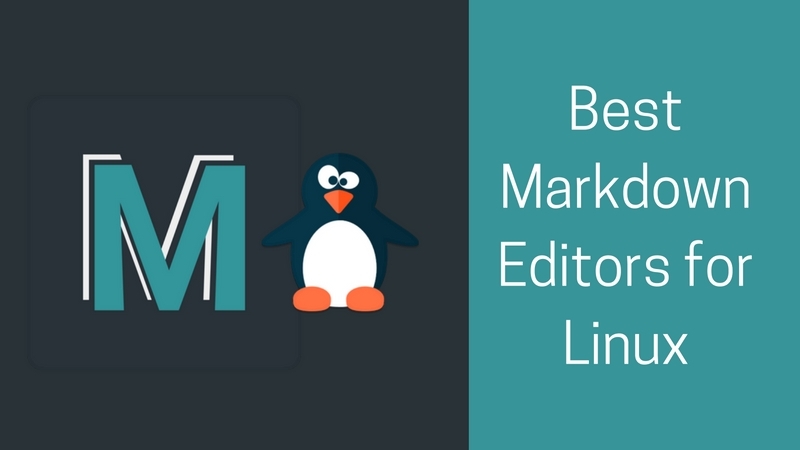 Today we’re going to present a list of what we think are the best Markdown editors for Linux. Just for clarification, the list is not in any specific order. 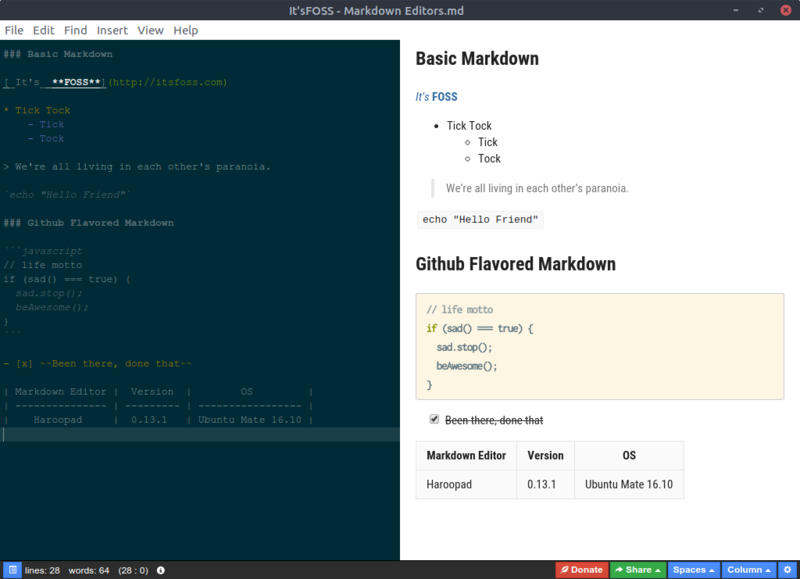 When it comes to markdown editors, Typora is as simple and elegant as it gets. It’s one of the most polished and feature-rich markdown editors we have encountered. Export to: HTML, PDF, ePub, Word, OpenOffice and bunch of other formats. Misc: Typewriter, Focus and Source Code Modes. FOSS? No, free of cost during beta version. Typora also offers a Themes Gallery and detailed Support Documentation. However, the only drawback Typora has is that it isn’t open source and according to their official website, it’s free only during the beta version. So, when the stable build will be released you’ll have to pay for it. Remarkable is under active development at the GitHub Project Page. You can easily grab the DEB file from the Remarkable download page and install it via GDebi. GitBook is a modern and simple solution to documentation, digital writing and publishing. And their editor fully supports markdown format. Export to: HTML, PDF, ePub, MOBI etc. If you need a feature-rich document processor that supports markdown, can keep track of document history or want to write a book using markdown document, GitBook is definitely for you! N.B. : If you have 32 bit Ubuntu system replace the 64 to 32. Abricotine is still in beta development. One drawback is that, because of being based on web technologies the application size is relatively large. N.B. : You can take a different approach for installing if you like. Haroopad hasn’t been updated for the last three years. But it works just fine if you can get used to it. Download the DEB package from Haroopad download page and install it via GDebi. ghostwriter has a theme repository on GitHub. If you want a dead simple, minimal and robust markdown editor without any fancy features, ghostwriter is really a good choice. Sadly, UberWriter hasn’t been updated for a long time, so it might be incompatible with the latest versions of Ubuntu. But if you want a quick and minimal solution for markdown editor and use Ubuntu Vivid Vervet (15.04) or older, UberWriter is a good choice. You can find additional information on the ReText GitHub project wiki. Extra Markdown features: Table of contents, footnotes etc. Misc: Dark, Focus & Typewriter Modes, Auto-completion etc. The high cost (about 15$) is obviously a drawback of Caret. Otherwise, it’s a great markdown editor. 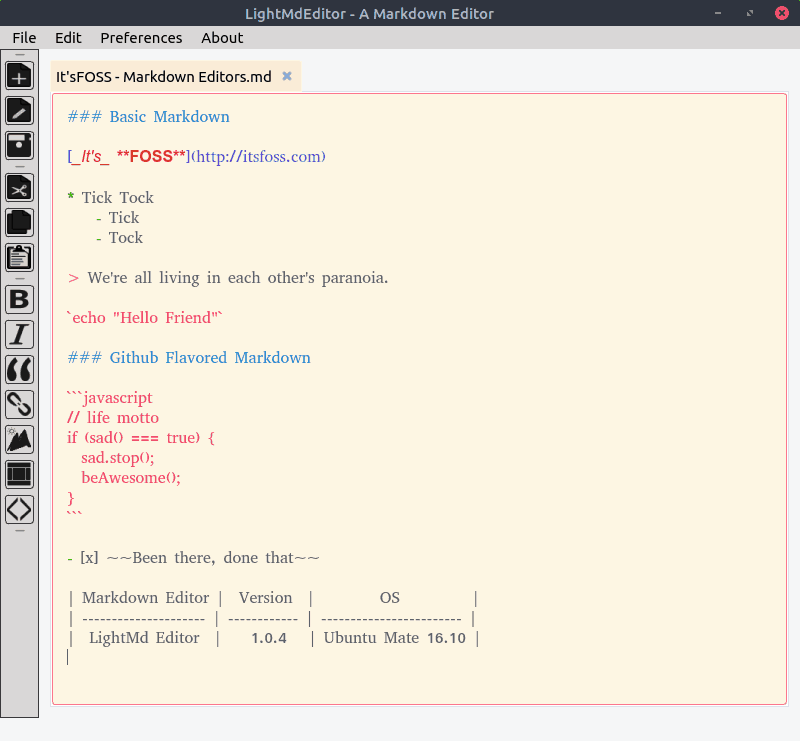 LightMd Editor is (as the name suggests) a light weight markdown editor. 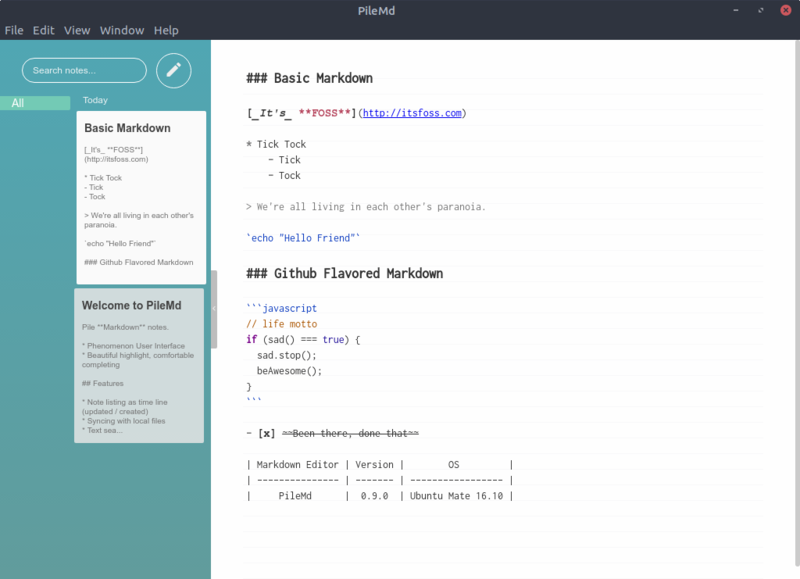 PileMd is more of a markdown note taking application rather than being just an editor. That’s all for today. 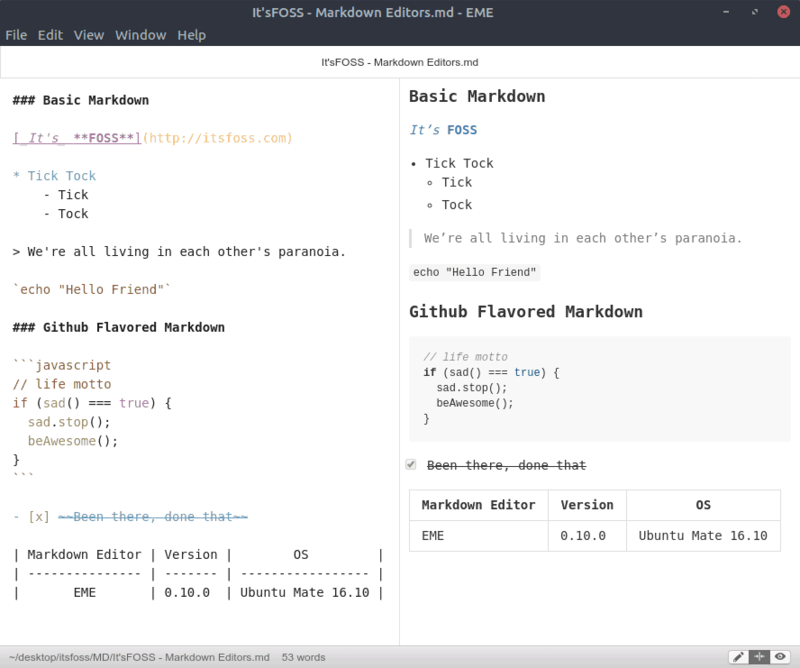 Which one do you consider the best Markdown editors for Linux? Did we miss your favorite Markdown editor? Share it with us. Please add HackMD.io to this list. It’s approaching awesome. It’s an online editor that allows multiple authors to edit a single markdown doc concurrently. The one thing left out of this list is whether the editors are based on Electron. I imagine many (most?) are and they just scream bloat. Looking at the interfaces, I would have liked to see noted, if it was possible, to edit in Graphical/Rendered Mode: ie… highlight an entry, select bold; click on menu, select table size; etc. None of these appear to do that and there’s lots of lost screen real estate keeping two windows open. Close the graphics/rendered window and you basically just have a text editor. Not knocking the solutions as they work well for many developers. I’ve been testing html-notepad (fairly new entry into this space) which is basically a lightweight wordprocessor based on html. Light on resources, clean html output and does, essentially, what the above do but allows you to actually edit in graphics/rendered mode: like a wordprocessor (but you can toggle into text mode easily). Uses html syntax as output, of course: which is the main purpose of the above editors. i do like some of the output formats mentioned above: pdf, odt, rtf, epub, etc. Is this the list of the worst markdown applications or what? The higher up in the list, the more horrible the application is! Perhaps you could consider MindForger – it is more than just Markdown editor, it is Markdown IDE. It is FOSS. I gotta say, this one looks awesome. I’ve tried at least 5 of the one’s towards the top of this list, and I like different things about them all. Your suggestion appears to have features none of the others include though.